The man suspected of an attack on a factory in France sent a selfie where he posed with the severed head of his boss, security sources say. Yassin Salhi, 35, reportedly sent the photo to a Canadian mobile phone number via the WhatsApp messaging service after Friday's attack near Lyon. His boss Herve Cornara's head was found alongside Islamic flags. The suspect is accused of ramming a vehicle into an area containing flammable liquids, causing a blast. Police have so far not found any motive or possible foreign connection, prosecutors say. In response to the attack, President Francois Hollande held a security meeting with ministers on Saturday. Prime Minister Manuel Valls cut short a visit to Latin America to return to France which is on its highest state of alert after the attack in the small town of Saint-Quentin-Fallavier some 40km (25 miles) from Lyon. Yassin Salhi had been investigated in the past about his alleged links with Islamist militants. Officials and residents of Saint-Quentin-Fallavier gathered outside the town hall on Saturday morning to observe a minute's silence. Investigators are still trying to establish the identity of the recipient of the selfie. They were unable to immediately confirm media reports that it was an unspecified person now in Syria, AP news agency reports. The agency quoted the Paris prosecutor's office as saying the suspect had begun speaking to investigators after initially keeping silent. Mr Salhi was arrested at the Air Products factory on Friday morning. Anti-terror police searched the apartment of the father-of-three in Saint-Quentin-Fallavier, taking his wife and sister into custody. Media captionWife of suspect Yassin Salhi told radio station Europe 1: "On the news it said a 'terrorist act' but it's not possible"
It is alleged he was waved through the gates of the factory because he was a regular delivery driver. The severed head of Mr Cornara was found placed on factory railings. It is unclear when he died. President Hollande said: "We have no doubt that the attack was to blow up the building. It bears the hallmarks of a terrorist attack." US-owned Air Products makes gases and chemicals and has employees in 50 countries around the world. Chief Executive Seifi Ghasemi said: "I believe I speak for all of our Air Products family around the world in expressing our deepest sympathies to the family of the victim of this unspeakable act." According to a report in the French newspaper Le Figaro (in French), a friend of Herve Cornara witnessed heated arguments between the delivery firm boss and his employee "several times". 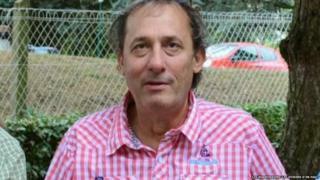 Mr Cornara, 54, is said to have been a well-known figure in the town of Fontaines-sur-Saone. He led a tenants' association and campaigned for better amenities in the area. "He fought with local authorities when the heating wasn't working," another friend recalled, speaking to AFP news agency. "He got involved in the campaign to save the post office."